Our Can't Stop The Serenity - Raleigh 2018 raised $4019. That is $3014 to Equality Now and $1005 to the Al Wooten Jr. Heritage Center. Thank you to all the sponsors, local crew, those that attended and those that couldn't but still bought tickets as well as our awesome host venue Raleighwood Cinema Grill. 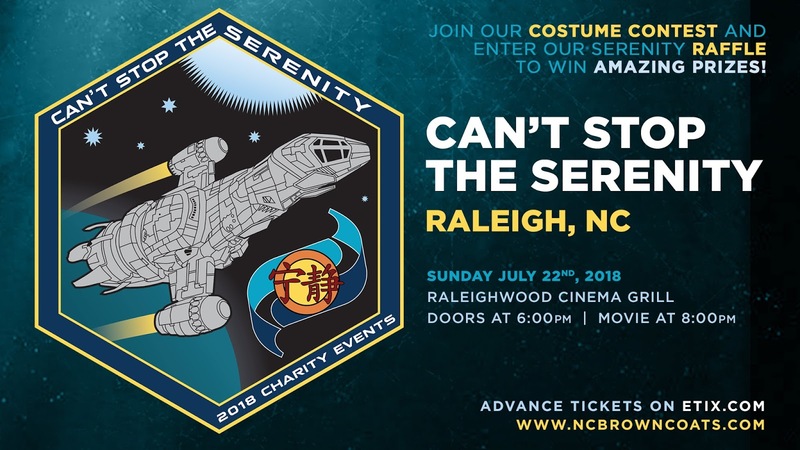 In our 13 years of Can't Stop the Serenity events here in Raleigh we have raised over $58,000 for charity. I think that makes you all Big Damn Heroes! Our 2017 CSTS Raleigh was held on Sunday July 30th. We raised funds for Equality Now & The Al Wooten Jr. Heritage Center, a charity near and dear to the wonderful Ron Glass's in honor of his memory. The event raised $4337! $3253 to Equality Now and $1084 to Al Wooten Jr. Heritage Center. Thank you to all the sponsors, Raleighwood Cinema Grill and the attendees. Our 2016 "Can't Stop The Serenity" event raised $4688! That's $3516 for Equality Now and $1172 went to Kids Need To Read. Thanks to all the sponsors, crew and attendees that helped make this another success. Keep Flyin' folks. 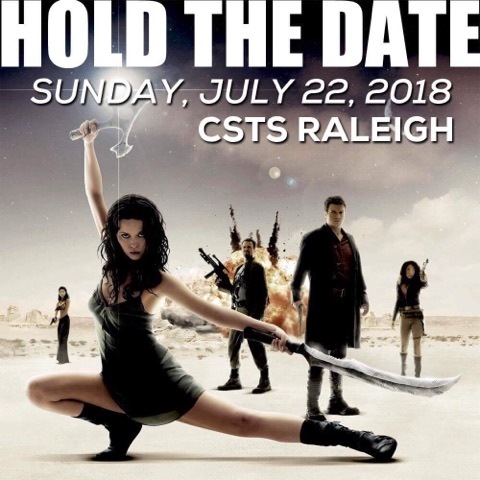 Founded by Jen Hilton in 2006, the Raleigh NC "Can't Stop the Serenity" event has sold out a 200 capacity theater in advance for five years running. 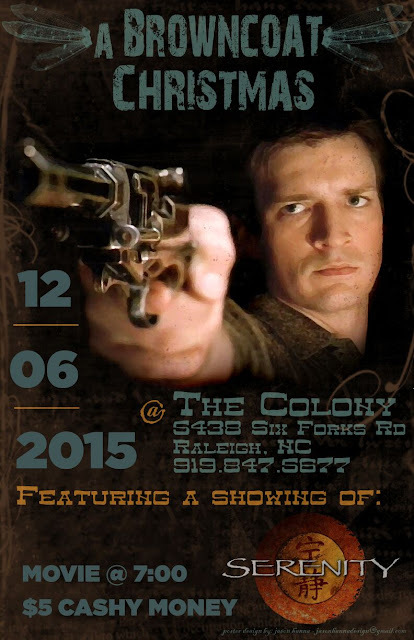 The Raleigh Browncoats are hoping to do the same again for this year’s event which will be on Sunday 24th July at Raleighwood Cinema Grill – doors open at 6pm and the movie starts at 8pm. Five years ago Jim Shires took over as local coordinator along with his small but mighty crew of helpers and sponsors. Jim explains: “At the very first Raleigh CSTS in 2006, I met then local coordinator and founder Jen Hilton. We had e-mailed each other about the possibility of an after party after the event. The CSTS itself was a great success but only myself, Jen and one other attendee showed up at the after party. When asked about why he became involved in the Serenity fan community, Jim responded “In 2008 (having been a Browncoat for 3 years) I came to find out about a Convention being held in Burbank California to celebrate Firefly & Serenity. I had never in my life been to a Con of any kind. Several of the cast were guests, Jewel, Sean, Summer, Adam & Ron. I tried to get a few folks from around here to go but for various reasons no one could take the trip. I decided that this kid (me) was gonna hop on a plane and go to California. My reasoning? Well they were all Browncoats, this was a Con for Firefly fans. I figured this was a trip I had to take. "I am so glad I did. The Con was great. I got to meet the cast and interact with them. Much more importantly though I met people in the community and fandom. 4 of them are some of my dearest friends to this day. Folks from all over the world. That is when I realized that from that day forward I was and will always be in a great community of the very best fans around. It has been and will remain an extremely positive aspect of my life." Jim and his team will be donating 75% of profits from their event to Equality Now & 25% to Kids Need To Read. They have also sent this sponsor video which gives some information on the crew (thanked at the end).